“President Obama is right to honor our troops who helped turn the tide of violence in Iraq during its darkest days. But it’s puzzling to listen to this White House try to take credit for the results of the strategy he and Vice President Biden adamantly opposed from the start. Senator Cornyn serves on the Finance, Judiciary, Agriculture and Budget Committees. He serves as the top Republican on the Judiciary Committee’s Immigration, Refugees and Border Security subcommittee. He served previously as Texas Attorney General, Texas Supreme Court Justice, and Bexar County District Judge. Miss The President’s Speech On Iraq? Read It Here! Americans across the political spectrum supported the use of force against those who attacked us on 9/11. Now, as we approach our 10th year of combat in Afghanistan, there are those who are understandably asking tough questions about our mission there. But we must never lose sight of what’s at stake. As we speak, al Qaeda continues to plot against us, and its leadership remains anchored in the border region of Afghanistan and Pakistan. We will disrupt, dismantle, and defeat al Qaeda, while preventing Afghanistan from again serving as a base for terrorists. And because of our drawdown in Iraq, we are now able to apply the resources necessary to go on offense. In fact, over the last 19 months, nearly a dozen al Qaeda leaders –and hundreds of Al Qaeda’s extremist allies–have been killed or captured around the world. (Houston, TX) State Representative Kristi Thibaut (D-Houston) will host a Veterans Benefits Fair on Wednesday, September 1st, from 6:00 p.m. to 7:00 p.m. at the Alief HCC Auditorium located at 2811 Hayes Road. Representatives from the Texas Veterans Land Board (TVLB), the Texas Veterans Commission (TVC) and local universities will be on hand to present information and answer questions regarding benefits available to veterans and their families. For more information on the Veterans Benefits Fair, please contact Jennifer Brader at (512) 463-0514. 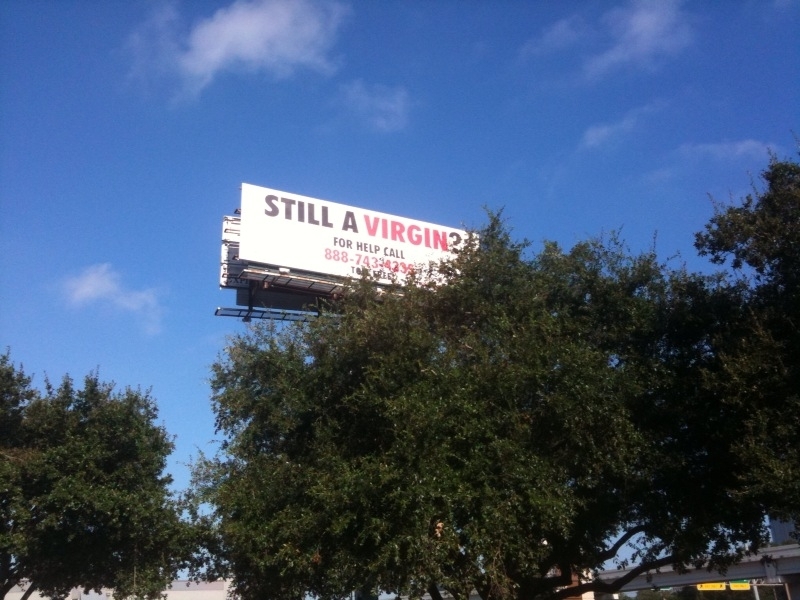 Never mind what your answer is to the question – ” Still A Virgin?” – I want to know how you feel about the billboard which is on full display at a location in Southwest Houston, near Highway 59 and 610. I saw it as I was driving to work, and stopped to take a picture and write down the toll-free phone number. After getting permission to call from work (story research) I dialed the number and followed the instructions. Basically all I heard was a man’s voice telling me to press 1 if “you’re still a virgin” or press another number if “you’re friends with a virgin.” Later on I was encouraged to find someone to help me lose my virginity. 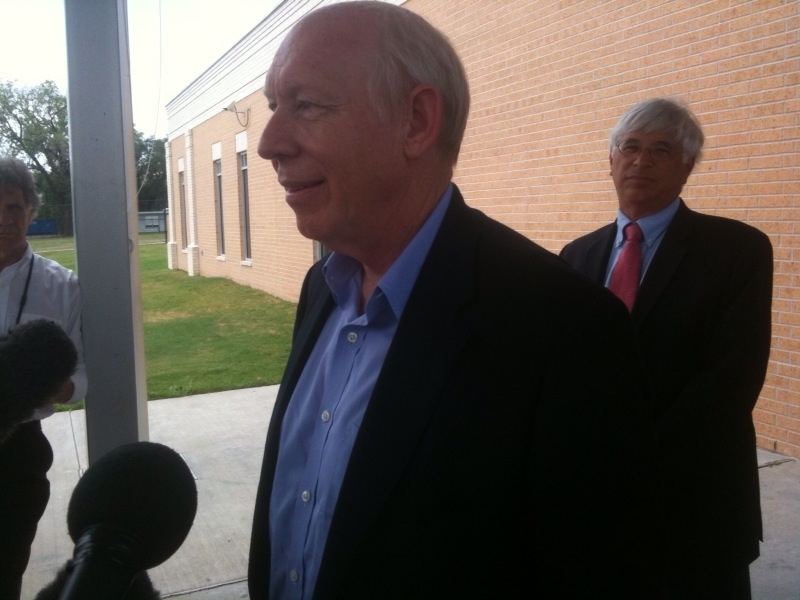 Hmm, ok.
Today, Bill White, former Houston mayor and democratic candidate for governor, is calling for gubernatorial term limits as he challenges Governor Rick Perry for the top job in Texas. Perry is currently the state’s longest-serving governor, having spent ten years in the office. If he wins in November, he’ll serve another four years. He’s never mentioned how long he plans to keep running for office. In a media statement White said, “Texas needs term limits to avoid excessive centralization of power in Austin and the use of power by special interests to entrench a governor in office,” said Bill White, in supporting a referendum on whether to limit the governor to two four-year terms. “Perry’s use of board appointees as a political fundraising machine demonstrates the need for term limits, which are in effect for the governors of 37 out of 50 states,” said White. “The public deserves to know from Rick Perry, not some spokesperson, whether he supports or opposes term limits for governor, and whether he supports letting voters decide,” said White. Harris County Election Woes – Should The DOJ Get Involved? On Monday, the Harris County Commissioners Court authorized $13.5 million for use by the Harris County Clerk to purchase new voting machines before November’s election. It’s an important move because the county’s voting equipment was destroyed in a fire last Friday. Beverly Kaufman said her office will also ask other counties in Texas to send e-slates to Harris County. Her office will also print paper ballots as backup. But some democratic state lawmakers have sent a letter to Eric Holder, the Attorney General of the United States asking the DOJ to oversee the development of new plans for conducting the election. Last Friday, August 27, 2010, a fire in a Houston warehouse destroyed nearly all of Harris County’s electronic voting machines. This dreadful event, occurring 51 days before the start of early voting in Texas, could have terrible implications for Harris County voters if not handled correctly. We are writing to request your office use its authority under the Voting Rights Act to assist and oversee the development of new plans for conducting the upcoming elections in Harris County in order to ensure that the plans that are implemented will adequately protect the voting rights of racial and language minorities. Our constituents represent the vast majority of African American, Latino, and Vietnamese voters in the county, and as you know, Harris County is one of the most diverse and most populous counties in the nation. While we are heartened by the stated intention of local officials in Harris County and across the state to conduct a fair and open election in November, we are concerned that some of the options for conducting the election could have an adverse impact on voter participation, especially in communities of color. The fire itself was devastating, but that devastation should not be compounded by the adoption and implementation of objectionable practices in order to make up for the loss of voting equipment in the fire. In recent elections, there have been controversial actions on the part of Harris County officials that administer and oversee voter registrations and elections. We ask your assistance in avoiding any such practices to ensure that every one of our constituents is able to participate fully in the November elections. Media reports have suggested that county election officials are considering the consolidation of the 739 polling stations planned for Election Day in Harris County. Improper consolidation of polling places can have the effect of discouraging turnout. In some previous elections, precinct consolidation based on population and turnout levels has resulted in the closing of neighborhood polls in minority precincts in urban districts, which poses a distinct problem for less mobile voters. Additionally, the presence of fewer voting machines in fewer locations creates longer lines, which further discourages voting. Removing neighborhood voting locations and fostering conditions for longer lines must be avoided to prevent suppression of minority voters. Further, adequate notification of changes in polling place locations must be given to communities. While we are fortunate that no individuals were harmed in the fire, we must work together to ensure that the voting rights of Harris County residents do not become the real victim of the fire. Thank you for your attention to this matter, please do not hesitate to contact us should we be of any assistance to your office in this endeavor. THE CITY OF GALVESTON WANTS TO HEAR FROM ITS RESIDENTS! development, housing and transportation and services for people with disabilities. residents’ input will be used to create the master neighborhoods plan. list of meeting locations and dates. Fort Bend Constable Ruben Davis is hosting his annual Community Prayer Breakfast on Saturday, September 4, 2010, beginning at 8:30 a.m. The event will be held at the Quail Run Community Center, located at 16, 748 Quail Park Drive in Missouri City. The guest minister will be Pastor Remus Wright who is the Senior Pastor of Fountain of Praise. The breakfast is free but you should rsvp: 832-444-5354 or 281-437-7500. Thanks to Terence O’Neill, with the city of Houston, for giving me permission to post this picture. 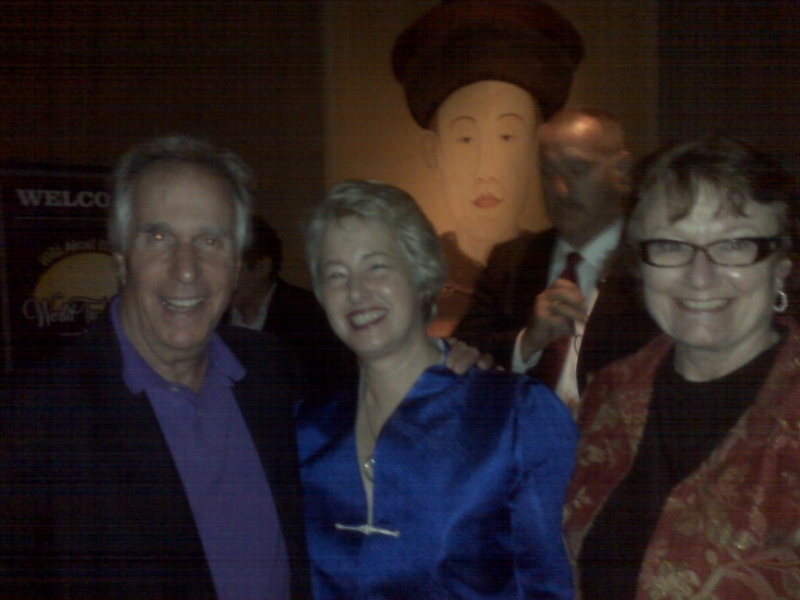 Over the weekend, Mayor Annise Parker and Henry Winkler, best known as “Fonzie or The Fonz” from the TV sitcom Happy Days”, met for the first time. The actor, director, producer and author was in Houston participating in a disabilities forum. He was staying at Hotel ZaZa where Mayor Parker and her partner Kathy Hubbard happened to be attending the Greater Houston Partnership’s World Trade Soiree. The Bill White campaign for governor of Texas is getting an experienced political operative to help the former Houston Mayor defeat Governor Rick Perry. 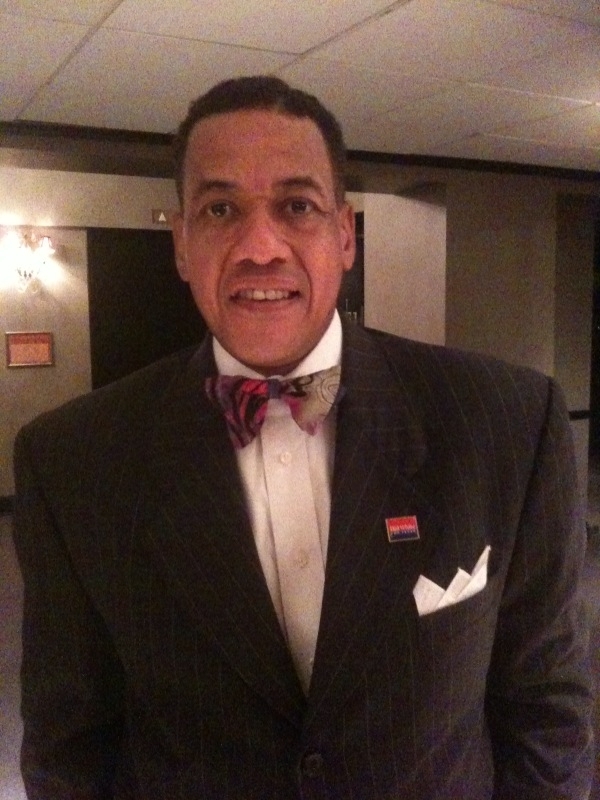 I ran into William Paul Thomas Saturday night at the Greater Houston Partnership World Trade Soiree. He confirmed to 2 On The Beat that he is joining the campaign through election day in November. Thomas plans to take a sixty day leave of absence from his job as chief of staff for Houston city council member Sue Lovell. He wouldn’t provide specifics about his role when I asked him to describe his responsibilities. He told me that he would to defer to the campaign to make the announcement. I assume that he is going to help White create some excitement and bolster election day turnout in African-American communities across Texas. I’ve heard grumblings from many Democrats that White is taking African-American voters for granted. Some are also upset that he doesn’t have a prominent African-American on his campaign staff. If White doesn’t give African-Americans a reason to vote for him in November, many will stay home, and he’ll have a tough time defeating Rick Perry. Thomas is a political campaign veteran and he has worked on staff for U.S. Rep. Sheila Jackson Lee and Senator Rodney Ellis, in addition to his current job at city hall.